First of all, its good to be back again. Secondly, the unfinished Captive Wallset from my other thread will be released when I get to the computer where those assets are stored, maybe in a month or so. Third, despite having abandoned that project and the Grimrock community in the past, I am going to embark on a new project. The scope is greatly scaled down. I am going to implement tileset models without textures (I am godawful at textures). The first phase of the project is to make a 3x1 corridor that will represent a small space shuttle/escape pod. Each Wall, Floor, Ceiling will be a separate and different model. Nothing will be animated and full features will not be implemented. Although the models themselves will have that capability. So that is 14 models. 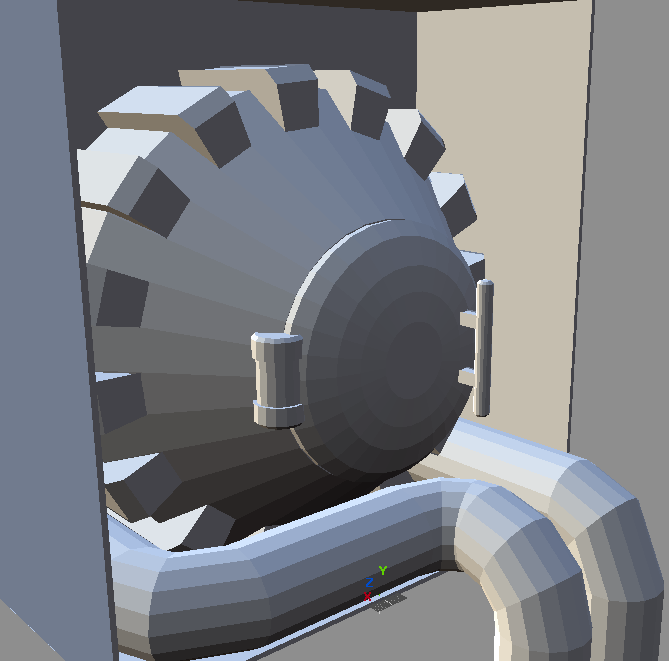 The first is the rear wall, which will be a recessed alcove (actually wall, but the model is capable of opening the door and placing an object, I just won't be scripting it in this phase). The pipes will run into wall01, wall09, and floor/ceiling05. This is wall 04. It will represent a power supply/engine furnace. The pipes will connect to engine nacelles at 01 and 09 and run into the floor/ceiling at 05. Despite sitting in a box (which I have no choice but to do in order to get my measurements lined up), the rest of the walls will be curved circular. Here is a picture. Sounds cool! For a SF theme - you may add some sort of gauges or .. control devices above/beside the power supply? Hi, brief update: Mesh is more or less complete. Right now I need to go on a genocide of faces to remove unseen sides for optimization and UVmapping convenience. After that I'll do grimrock implementation and post a ingame screenshot. edit: clocking in at 1799 faces before optimization (probably double that in triangles) which should be no problem for any computer post 2007 or so. Note: I have no clue how to properly implement that datascreen on the right. I have some ideas, but I figure thats best left for later phases. First, we have more modelling to do. Once that's done I'll move on to the engine nacelles at 01 and 09, which will receive those tubes at right and left, so if anyone knows the mathematics to mirror and then rotate (not just rotate) a mesh, it would help me out since I seem to have forgotten. That will come in handy tomorrow or the day after. Just fine! Much better now. Should it have a worn, rusty look or clean and new (textures)? Quick Reply: I use Wings3d for mesh creation because I am most familiar with its functions, I have blender and use it for advanced transform functions and everything else. But really, it is too feature rich so I can't say I actually "understand" blender. So yes, I was asking above for the blender instructions to mirror a wall mesh. As for the look: I was thinking that it is stuff that was new at some point, but has since been neglected for years. If you want to tweak the pipe knees - some could need extra edge loops i guess - use edit mode in blender (tab), there press ctrl+r. Press s to scale the edge loop. I'll make a note of that, yeah I agree. 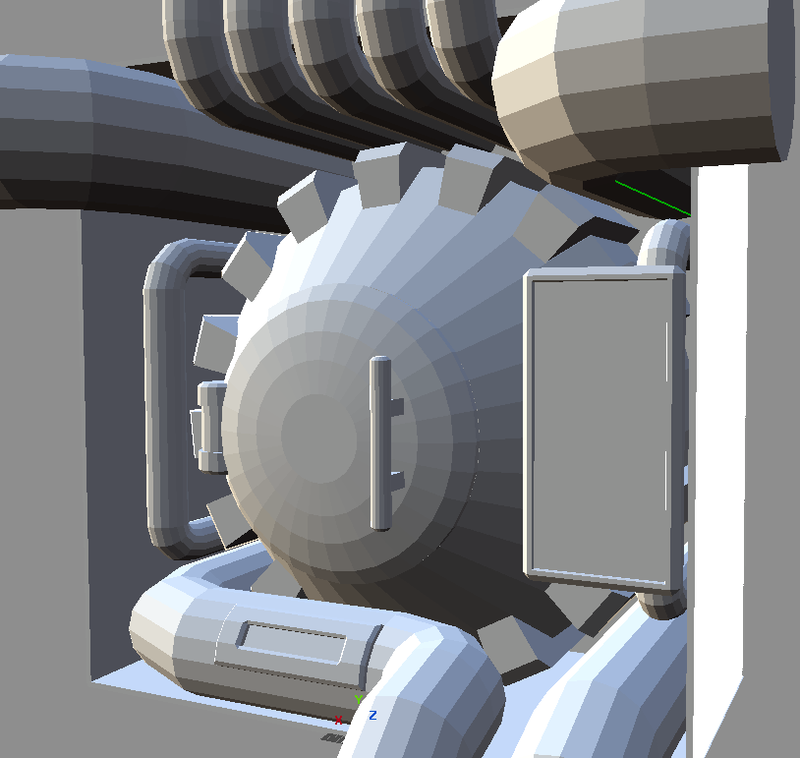 Around the time of texturing I'll probably go back and redo some of those pipes. But what matters now is that the general location is right. HELP. I have forgotten too much about Grimrock since the last time I used it. I am trying to implement an .obj that has no UV map, and no texture. I am trying to just make a placeholder texture without doing correct UVmaps just so that It will show up in the dungeon editor so I can check if everything is correct geometry wise. edit: link to a detailed complete, not partial model implementation tutorial would be most helpful. I can only seem to find partials. Well, ive run into a new problem, and I can't seem to fix it. But the .model file IS in the proper loacation. My wallset is blank. Grimrock editor load up, but when I place the object and try to preview, it crashes with that error message. Couple of things could be the cause: The model is larger than the 3x3 "box", could there be some setting I would have to change in Grimrock Model Toolkit? Or is it simply impossible to have objects be larger than the 3x3 grid? I'm pretty sure models can be as big as you like and can definitely be bigger than the 3x3 box, so I expect when it states that it can't find the file, the problem lies somewhere in the loading of the model. Some possibilities solutions could be... (please excuse that some of these might seem obvious, I'm just listing everything I can think of). 1. It's a good idea to use lower case filenames for everything inside of the mod_assets folder. Some operating systems are case-insensitive whereas others do care about case - but once it is compiled into the .dat file case does matter - so you can end up with situations where it works fine in the editor but then crashes in the .dat file. 2. Are you sure that you used 'Save As' in the GMT and saved it as a .model file (not as a .obj file). 3. Make sure you don't have "hide file extension" turned on in windows and that the file isn't actually called file.model.model. 4. Ensure you have reloaded the .lua files after any changes by reloading the dungeon in the editor.